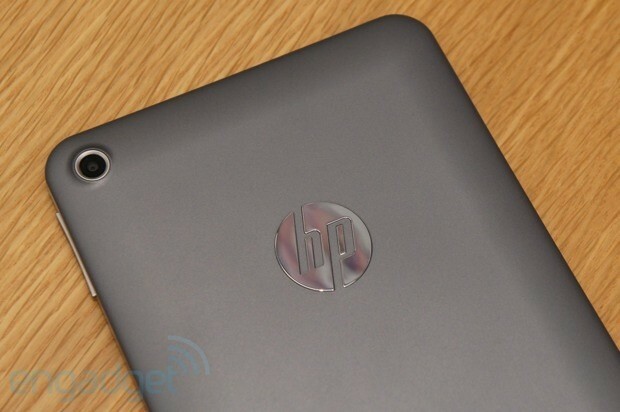 It's no secret that HP has struggled when it comes to tablets. The company has faced (and crashed into) its share of mobile device hurdles in recent years -- most notably, with the ill-fated and expensive TouchPad. With its latest foray into the tablet world, HP is hoping to hit one out of the park with the Slate 7, a budget tablet that retails for $170 in the US ($140 with instant savings). We set out to discover how the Slate 7 would fare in the competitive Android tablet market, especially compared to its current rival, the Nexus 7, and the forthcoming ASUS MeMo Pad HD 7. 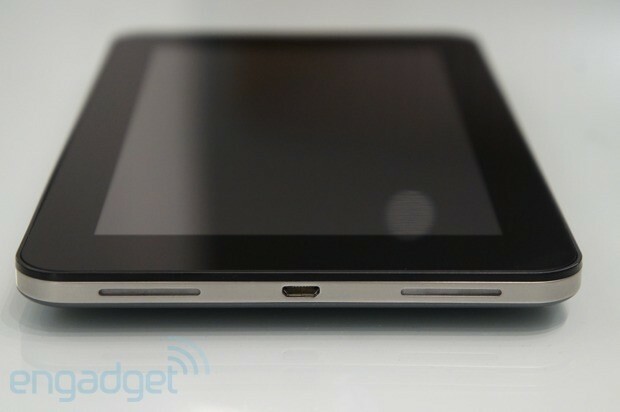 So, is the Slate 7 HP's little tablet that could? Read on to find out. How would you rate the Slate 7? 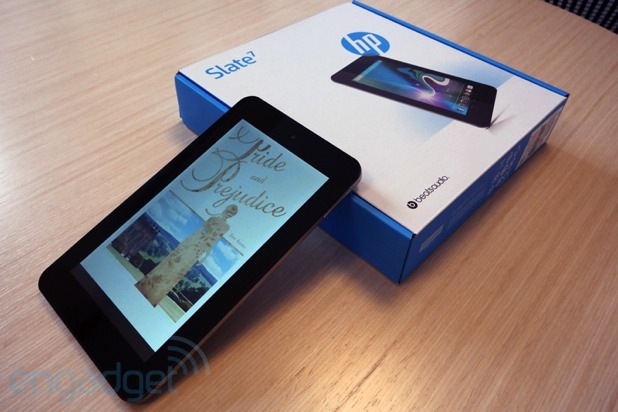 For a tablet of its size (7.8 x 4.6 x 0.42 inches), the Slate 7 feels pretty heavy. Unlike some of its ilk, HP elected not to pursue a sleeker, unibody design, and the result makes for a device that's a little bulkier than you might want it to be. The Slate 7 has a stainless-steel frame surrounding a glass display with a standard black bezel. At the top of the tablet, two small screws hold the whole shebang together. The shiny HP logo emblazoned on the soft-touch backing (available in dark gray or bright red) is joined by relatively small, but still very noticeable Beats Audio branding (more on that later). The device's serial number can be found awkwardly squished on the steel accent on the side. The power button is located at the top, along with an unmarked microSD card slot and a 3.5mm headphone jack. The volume rocker on the right-hand side (with the device facing you) is made of the same sturdy steel as those aforementioned components, and it's one place where HP didn't cut corners. Obviously, a budget tablet won't be made of 100 percent premium materials, but it's good that HP used them for those buttons that we frequently handle. Flanking the micro-USB socket at the bottom are two small speakers, whose performance we'll get into shortly. That port feels a little flimsy, and the wire wobbles quite a bit when jostled. That being said, some lower-priced tablets feel like they have all the stability of a box of Kleenex, so the Slate 7 actually seems pretty sturdy by comparison. At 13.05 ounces, the little extra weight the Slate 7's carrying around is a testament to its solidity. The soft-touch backing feels luxe at first touch, but the chalky texture might grate after a while, even if it is decently scratch resistant. It also hides a rather flimsy plastic backing. Pressing down on the HP logo on the back of the tablet causes a noticeable (and audible) depression in the device's rear panel. The steel frame grants the Slate 7 some much-needed stability on the sides, but what's under the hood might be more fragile than it initially seems. Out of the box, the tablet packs eight gigs of storage space (nearly six of which are actually usable), plus a microSD card slot. If you're hoping to beef up your storage space, know that you'll be limited to a 32GB card. The Slate 7 doesn't pack a whole bunch of bells and whistles -- there's no GPS or Bluetooth 3.0 or 4.0. Out of the box, it comes with Bluetooth 2.1 with EDR, 802.11b/g/n and an accelerometer. The latter proved to be reasonably responsive, though we did notice the occasional stutter as the display shifted orientation. Using the Slate 7 is an intensely vertical experience. The tablet is built according to a slightly narrower-than-normal form factor, and due to an unusual aspect ratio, everything is just... off enough to be noticeable. The 1,024 x 600 screen isn't great to begin with, especially when compared to the Nexus 7's 1,280 x 800 IPS display (currently $30 more, but a much better buy). At 169 pixels per inch, that resolution would have worked on a slightly less rectangular form-factor (a 5.86-inch display would have worked with the tablet's 4.44-inch width). Considering that the Slate 7 comes with stock Android 4.1.1, the flatness of the UI makes the stretch especially obvious. Even round icons are more oval than circle. Again, for a budget tablet, we weren't anticipating much from the display, but the Slate failed to live up to even our modest expectations. 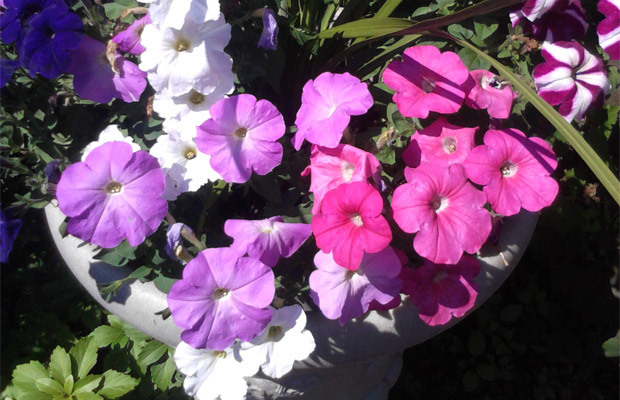 The colors aren't particularly vibrant to begin with, but any viewing angle other than straight-on caused them to be significantly washed out. The technology HP used for oblique viewing angles -- "Fringe Field Switching" as opposed to IPS -- does little for the LCD display when the device is angled even a little bit away from the viewer. When it comes to sound quality, HP is putting all its eggs in one Beats Audio-branded basket -- as it's done with many of its products. 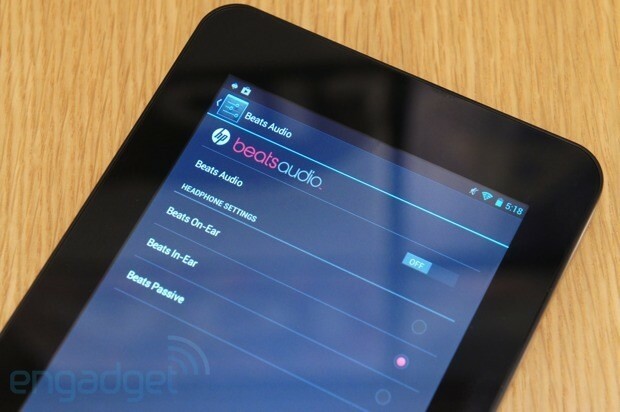 From the Beats logo on the back of the tablet, to the Beats-specific tab on the settings menu, HP is aggressively pushing the relationship at consumers. The dual speakers located on the bottom of the tablet are adequate in the truest sense of the word, which is to say: they work. Because they're so close together, there's no real stereo sound despite there being two of them. Do they sound like $170 speakers? Not really. Played at reasonably loud volumes, the audio is strained and tinny, as is the case with many a mobile device. With the Beats Audio feature toggled on, vocals on most songs had a noticeable echo not present when it was turned off. When it comes to headset use, we must admit there's a certain level of cognitive dissonance required to use -- or even worse, acquire -- a pair of headphones more expensive than the device you intend to couple them with. But if you're a Beats fanatic (we know you're out there), then perhaps the Slate 7 will tickle your fancy. For those of you who aren't immediately charmed by the promise of Beats Audio's potential (and so far, we see no reason why you should be), the actual feature is pretty lackluster. Beats Audio can be toggled on or off, but it's basically nothing more than a jazzed-up EQ setting. We tried out the Slate 7 with a few different types of headphones -- admittedly, not Beats -- and there didn't seem to be anything special about Beats Audio's performance aside from slightly deeper bass (an effect achieved with regular ol' EQ settings). HP promises that the sound setting is "optimized" for Beats Audio headsets, but there seems to be little evidence to support that the claim is more than a mutually beneficial marketing strategy. 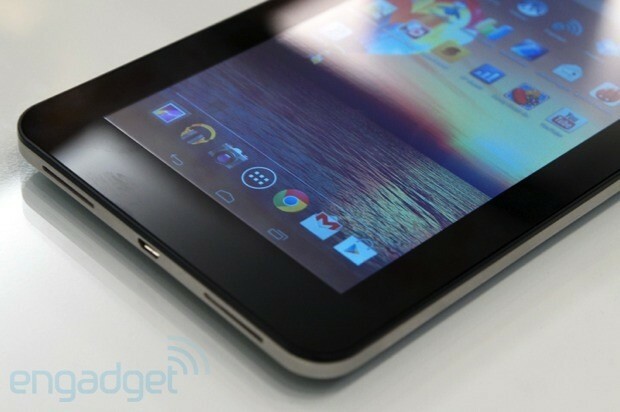 In addition to the standard Google suite of apps (Gmail, Chrome, Google+, Search, Maps, et cetera), HP has made only two modifications to the Slate 7's stock Android 4.1: Beats Audio and HP ePrint. We've already discussed the efficacy of Beats Audio at length, so we'll avoid the rehash here. HP ePrint is a neat idea, but not necessarily one with loads of practical application. The app (which can also be found in the Google Play Store) is only compatible with select wireless HP printers – if you've got one, you're all set. If you don't, HP ePrint will be useless to you. We're happy to note that the Slate 7 is otherwise free of any unnecessary Android skinning, and the stock 4.1.1 Jelly Bean experience is as streamlined and user-friendly as one might expect. When it comes to software, HP evidently prescribed to the less-is-more school of thought, and the decision to not overburden the Slate 7 with an array of bundled apps pays off. The Slate 7 comes armed with a 3-megapixel rear camera, as well as a front-facing VGA shooter. In brightly lit outdoor settings, the camera performs reasonably well, and the colors are vibrant considering the low-end specs. The absence of an autofocus feature meant that stabilizing our photographic experiments proved more difficult than perhaps it should have. Also, the tablet lacks both a flash and exposure adjustment, so you'll pretty much have to hope for decent lighting wherever you are. Video recording on the Slate 7 isn't good for much beyond grainy Skype chatting. In decently lit environments, the video we took -- with a resolution of 640 x 480 -- was fairly blocky, and the colors were excessively washed out. Admittedly, you probably don't want to be that person with the tablet camera in public (that person is obnoxious), but if you absolutely must, know that you'll be getting low-quality images with poor contrast and a lot of ISO noise. Might as well just use your phone. The Slate 7's no-frills 1.6GHz dual-core ARM Cortex-A9 processor and 1GB of RAM put in a decent effort -- in theory. According to our benchmark tests, the Slate 7 scored within a reasonable distance from its current competitors, but the numbers don't paint the most accurate picture. Essentially, the specs look good on paper, but in real-world use, they have more inadequacies than rival devices. Simple games ran fine (including the current bane of our existence, Candy Crush Saga), but titles like Temple Run 2 that asked more of the Slate 7 showed a slight lag. While browsing in Chrome, we also noticed several problems with performance, even with sites optimized for mobile use. The latency on non-mobile sites was bad enough to make browsing nearly impossible. When zooming in and out, tiling became an issue and it took a while for the Slate 7 to adjust. Likewise, we experienced a significant delay when scrolling up and down on Engadget's mobile site. Opening apps was a mostly speedy affair, but keeping them open was a tall order as several apps crashed repeatedly. Switching between apps on the launcher was fairly quick, but we noticed some stuttering as we scrolled through our options. The Slate 7's battery life isn't exactly mind-blowing -- the tablet comes equipped with a 3,500mAh lithium polymer battery that's almost enough to survive an entire day of light usage. Starting from a full charge, we looped a 1,280 x 720 video continuously until the battery sputtered and died, wheezing out its last, pained breath. With the brightness set at 50 percent, the Slate 7 lasted seven hours and 36 minutes. With the same video looping at maximum brightness and sound, the tablet kept on trucking for four hours and 47 minutes. Indeed, HP claims about five hours of video playback, so our results match up nicely. Those numbers aren't terribly impressive, especially when you consider that the Nexus 7 clocked 9:49 on the same test. In a slightly less scientific -- but perhaps more relevant –- test of everyday use, the Slate 7 chugged along adequately. After about three hours of continuously watching YouTube videos, playing games, web browsing and streaming music via Pandora, the Slate 7 had more than half of its battery life left. That being said, if you're heavily dependent on a tablet during your workday, you'll probably need to recharge at some point. HP is facing some pretty stiff competition in the budget tablet market, and the Slate 7 doesn't quite stack up, even against the soon-to-be-outdated Nexus 7. With companies like ASUS, Samsung and Acer debuting their latest similarly sized offerings, HP's position is about to become even more precarious. Samsung's 7-inch Galaxy Tab 3 will hit stores on July 7th with a sticker price of $199, and the specs are pretty similar to the Slate 7 -- the tablet comes with a dual-core 1.2GHz processor, a 1,024 x 600 display and eight gigs of storage (with up to 64GB of microSD expansion). But specs, as we've seen, don't always tell the whole story. Since the Slate 7 didn't quite live up to its potential, we'll have to see how the two devices compare on performance tests. Boasting even better specs is the ASUS MeMo Pad HD 7, set for an August release. From the looks of it, you'll get more bang for your buck there. The 16GB version will retail in the US for $149, while emerging markets will see an 8GB model for $129. Considering that the MeMo Pad has a better display, more powerful processor and increased storage space when compared to the Slate 7, it looks to be the better buy. Similarly, Acer's Iconia A1 tablet -- armed with a quad-core 1.2GHz MediaTek processor and 7.9-inch screen -- hits the Slate 7 where it hurts the most: the screen. The A1's humble, yet commendable 1,024 x 768 IPS display offers a much wider range of viewing angles than the Slate 7. For a casual user, the Slate 7 might be a good enough tablet, but at this price, good enough just doesn't cut it. Simply put, the display is disappointing, even for a budget product, and the specs prove better in theory than in practice. It simply can't hold a candle to devices currently (or soon to be) on the market. If this tablet were $40 cheaper, our verdict might be more generous, but as it stands, it's overpriced for the quality you get. HP seems to have gotten the memo, as it's now offering a $30 instant rebate on both the 8GB and 16GB models (bringing the former down to $140 and the latter to $170). There are other budget tablets out there that are better, faster and stronger than the Slate 7, and you might be better served by looking elsewhere. Edgar Alvarez, Daniel Orren and Zach Honig contributed to this report.